In the report, published by WADA, the three-member IO panel said the Commonwealth Games Federation (CGF) and the Australian Sports Anti-Doping Authority (ASADA) should share the model they used with other event organisers. Elements such as the taskforce between the CGF, ASADA and the Organising Committee, the gathering and sharing of intelligence and risk assessment were among the areas which came in for particular praise from the IO team. The IO report was largely positive about the overall anti-doping system, although whereabouts was cited as the biggest weakness. The findings in the document were in stark contrast to previous IO reports from other Games, which have been much more critical of the anti-doping operation in existence at events including the Olympics. 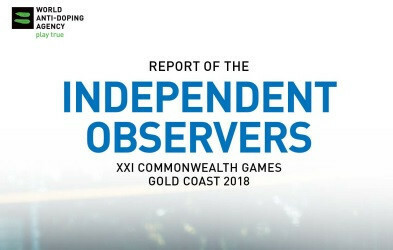 "The CGF repeatedly described the 21st edition of the Commonwealth Games as a ‘Games of firsts,'" the executive summary of the report reads. "From an anti-doping perspective, this rang true. "With its partners, the CGF was able to deploy an intelligence-led doping control program that sought to make an impact on the detection and deterrence of doping prior to the event, over the course of competition itself, and even post-event." The report acknowledged, however, that it was not possible to have this level of anti-doping operation at every Games as ASADA was better equipped than a number of the National Anti-Doping Organisations from countries that compete at the event. The IO team, led by WADA deputy director of standards and harmonisation Stuart Kemp, highlighted the input of ASADA as crucial to the success of the system at Gold Coast 2018 and encouraged those involved in the taskforce to share their project with future major event organisers. Whereabouts was the principle concern outlined by the IO, which also urged the CGF to increase the amount of out-of-competition tests. The IO panel conceded whereabouts information was a problem mainly as some Commonwealth Games Associations "appeared to lack the IT proficiency to complete the template forms, while others seemed completely unaware of or completely disregarded the requirement". It said the whereabouts system was "disproportionate". "With less than 250 samples collected out of competition, it cannot be considered commensurate to require whereabouts information from more than 6000 athletes," the report stated. Before the Games, CGF President Louise Martin claimed the programme in place will help restore confidence in anti-doping following the Russian scandal. Gold Coast 2018 chairman Peter Beattie also insisted the event would be a "cheat-free" zone. The report confirms there were no positive tests at the Games but there were three hearings in front of the CGF's Federation Court regarding the no-needle policy. "In the case of the Gold Coast Commonwealth Games, it is pleasing to see the manner in which the CGF leveraged partnerships with both the ASADA and other stakeholders in the fight against doping in sport to employ as robust a programme as possible," said WADA director general Olivier Niggli.